The Sensitivity Values dialog appears when you click the Sensitivity button on any page. You can multiple values for that input variable to perform a sensitivity analysis of the variable. •You can link this variable to another by selecting the other variable from the "Link with" drop-down menu. •Enter values for the variable in the table. They do not have to be evenly spaced or in any particular order. For more information, see the Sensitivities Variable section of the help. 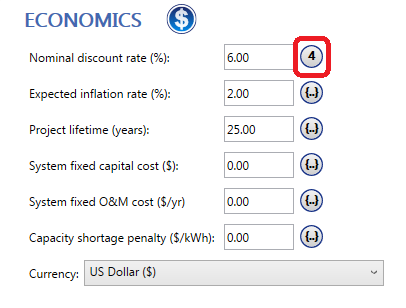 In the following example, the user entered several values for the Nominal discount rate. The discount rate is, therefore, a sensitivity variable in this example.